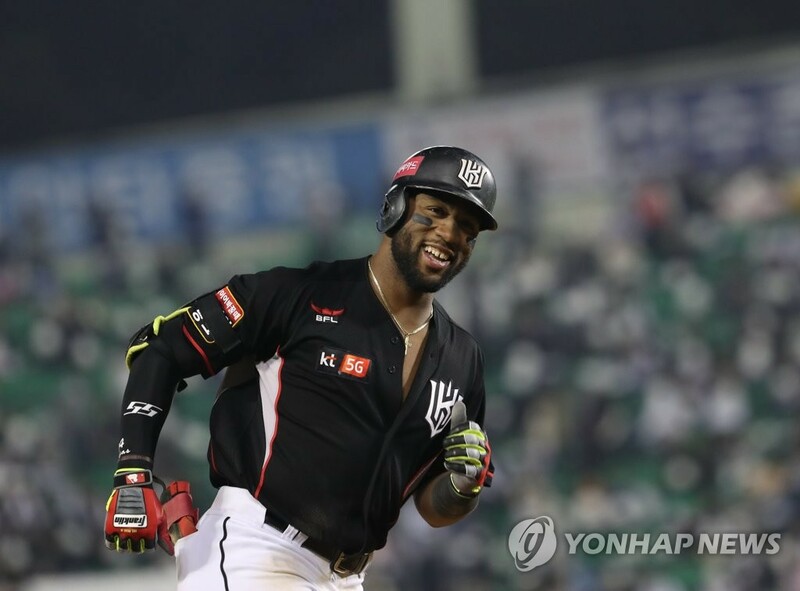 Home > Sports > KT Wiz re-sign American slugger Mel Rojas Jr.
KT Wiz re-sign American slugger Mel Rojas Jr.
SEOUL, Dec. 28 (Yonhap) — South Korean baseball club KT Wiz said Friday they’ve re-signed American slugger Mel Rojas Jr. The Korea Baseball Organization (KBO) club said Rojas agreed to a one-year deal worth US$1.6 million. He will receive US$500,000 as a signing bonus and US$1 million in salary, and can make US$100,000 in incentives. Rojas played all 144 games for the Wiz this past season, batting .305 with 43 home runs and 114 RBIs. He was paid US$1 million in 2018. The 28-year-old, the son of former major league pitcher Mel Rojas, joined the Wiz in June 2017, and recorded .301 with 18 home runs and 56 RBIs in 88 games in his KBO debut season. With Rojas, the Wiz completed their foreign player roster for the 2019 season. The Wiz, who finished ninth in the 10-team league in the 2018 season, previously signed pitchers Raul Alcantara and William Cuevas. Rojas is the last foreign player to sign a contract with a KBO club for the 2019 season. KBO clubs are each permitted a maximum two foreign pitchers and one foreign position player. Rojas signed the third-most lucrative contract for a foreign player in the 2019 season. Doosan Bears pitcher Josh Lindblom can make US$1.92 million followed by Samsung Lions slugger Darin Ruf who recently inked a deal worth US$1.7 million.